Christian Witness: New. Drs Angela and David Franks talk with people who work to build a culture of love and life rooted in the New Evangelization. Guest: Mary Girard speaks about pregnancy help centers. We've Got To Talk: New. 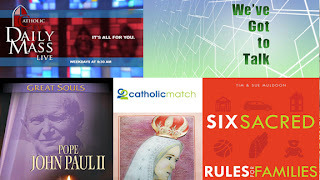 Fr Dan continues CatholicTV's longest running studio series. This week's topic- "Touched by His Spirit". One Billion Stories: New. Join Seth DeMoor as he continues sharing the stories of Catholics around the world. This week we hear stories about Mary. Spotlight: Encore. The film fathers talk about the movie Rush this week on Spotlight, CatholicTV's movie review show. WOW: The CatholicTV Challenge: New. Father Robert Reed tests 3rd graders' knowledge in the 9th season of WOW. This week's "Wudabout": Sacrosanctum Concilium, the Vatican II constitution on the Sacred Liturgy. Tuesday 10/22- Dean Robledo on expressing faith through art. Friday 10/25- Sue and Tim Muldoon, authors of Six Sacred Rules for Families. The Gist: New. Rachel, Danielle, and Carolee host another great episode of The Gist. Our guest is Robyn Lee of CatholicMatch.com, and our topic is Catholic singles. This week, in honor of the optional Memorial for Blessed John Paul II- John Paul II, part of the Great Souls: Six Who Changed a Century series.